St Patrick's Day events in Boston include the St. Patrick's Day Parade in South Boston (locally known as "Southie") - but that's only the beginning of fun things to do. Join the Dropkick Murphys' rollicking annual House of Blues concerts, or visit our famous Irish pubs. Or explore Boston's Irish heritage along the Irish Heritage Trail, or check out the Irish Film Festival. 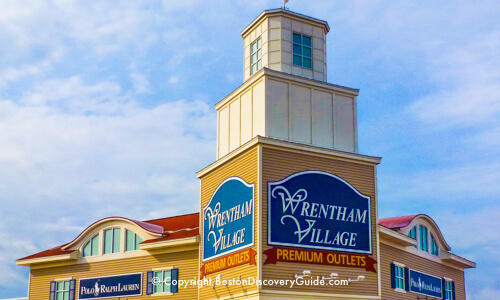 You'll quickly see why Boston is considered to be the most Irish of any American city! Best of all, you'll also get to experience a bit of "real" Boston culture. Check details about the date and time for the parade and other events on our March Events Calendar. St Patrick's Day is actually an official Boston (and Suffolk County) holiday because it happens to fall on Evacuation Day, which commemorates the ousting of British troops from the city on March 17, 1776 during the Revolutionary War. Public schools and Suffolk Country government offices will be closed, but virtually all businesses and everything else will be open. The huge St. Patrick's Day Parade in South Boston takes center stage on the Sunday closest to March 17th, attracting up to one million spectators. 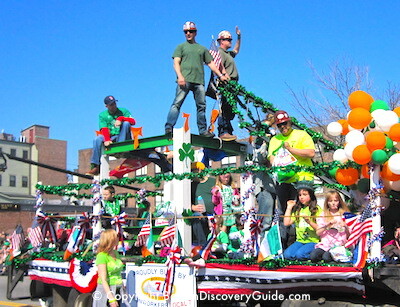 You'll enjoy the colorful floats, Irish and American pipe and drum bands, and enthusiastic crowds. Just be sure to wear green. Find the updated St Patrick's Day parade route through South Boston. 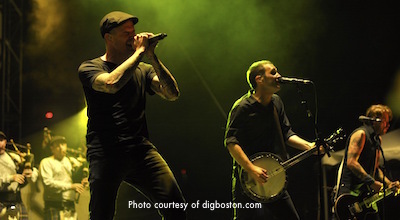 Boston's most famous Celtic punk rock group, the Dropkick Murphys, spends most of their time touring since becoming so popular, but they always return home to Boston to perform concerts St Patrick's Day at House of Blues, near Fenway Park. Needless to say, the Dropkick Murphys' rollicking performances sell out quickly, but if you're a fan, you'll want to catch one of these concerts. Get your tickets (and find discount codes) now! 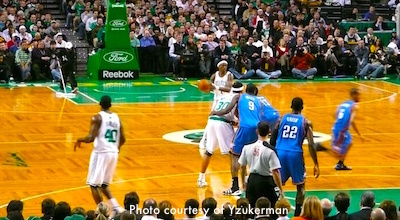 Of course a Boston Celtics game is not just a St. Patrick's Day event - but what better way to show your Celtic spirit than dressing in green and cheering for the home team at a game in TD Garden? Tickets are affordable, TD Garden's downtown location is super-easy to reach (just take the T to North Station), and you'll find plenty of Irish pubs/sports bars nearby. So get your Celtics tickets, wear lots of green, and cheer our home team! If you're going to South Boston for the big St Patrick's Day Parade, head over to West 6th Street to cheer on the runners of the St Patrick's Day 5K Road Race, where the first lucky 600 runners to register will be wearing the official long-sleeved race shirts designed by the Dropkick Murphys, one of the race's sponsors. 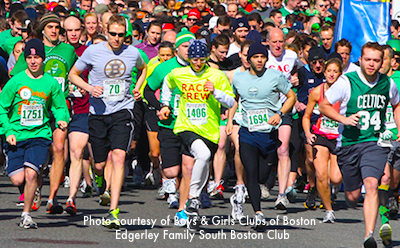 The South Boston Boys and Girls Club sponsors this race, run each year since 1940. Entrants are capped at 1,750 - so early registration is advised. The race starts and ends at the South Boston Boys and Girls Club at 230 West 6th Street in South Boston, and follows a 5K (3.1 mile) course. 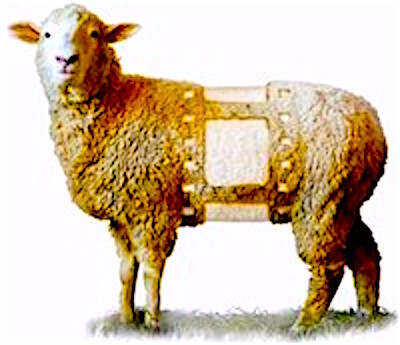 Check the Boston Event Calendar for March for the exact date and time. St Patrick's Week at Lansdowne Pub (9 Lansdowne St, across from Fenway Park) - Live music all week, with an all-day show and plenty of Guinness on March 17 starting at 10am. 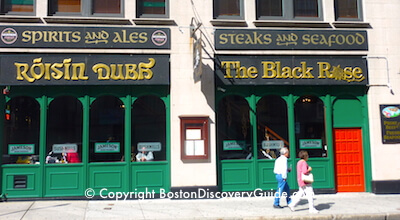 The Black Rose - Irish musicians perform here (160 State Street, Downtown Boston, behind Faneuil Marketplace) every night of the week, and often on Saturday and Sunday afternoons as well. If you've ever experienced the pleasure of a trad session in Ireland, you'll come close to finding the same thing here, along with plenty of Irish craic. The menu features a few Irish specialties, and of course plenty of Guinness at the bar. You can find the current schedule on the Black Rose's website. Mr Dooley's Boston Tavern - (77 Broad Street, near Faneuil Marketplace) - Doors open at 9am on March 16th and 17th for a weekend of non-stop live Irish music. Boiled Irish dinner available for the entire month of March. More on Mr Dooley's Facebook page. The Harp - Celebrate St Patrick's Day at The Harp with corned beef and cabbage and other Irish food specials plus entertainment all day with Irish Step Dancers, Black Rose Band (12 noon - 4pm) and Never in Vegas (5pm-9pm). Check their Facebook page for more information. Not surprisingly, you can find some of the best Irish food in Boston's Irish pubs. 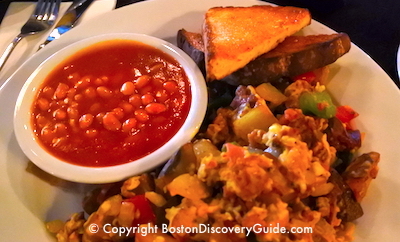 Lansdowne Pub (9 Lansdowne Street across from Fenway Park) - Go for the Irish Scrambler (shown in photo, brunch only), the Irish Breakfast, and house-made Bangers and Mash. Live music on many nights; weekend brunch. The Kinsale (2 Center Plaza on Cambridge Street, across from City Hall Plaza) - Built in Ireland and shipped to Boston, the Kinsale replicates a real Irish pub. Try the Asgard Burger made with real Irish cheddar, or the Irish Cod. Live music in the bar; weekend brunch. The Black Rose - (160 State Street, Downtown Boston, next to Faneuil Marketplace) - Order the Irish Breakfast (breakfast menu only) with black and white pudding, or the Shepherd's Pie. 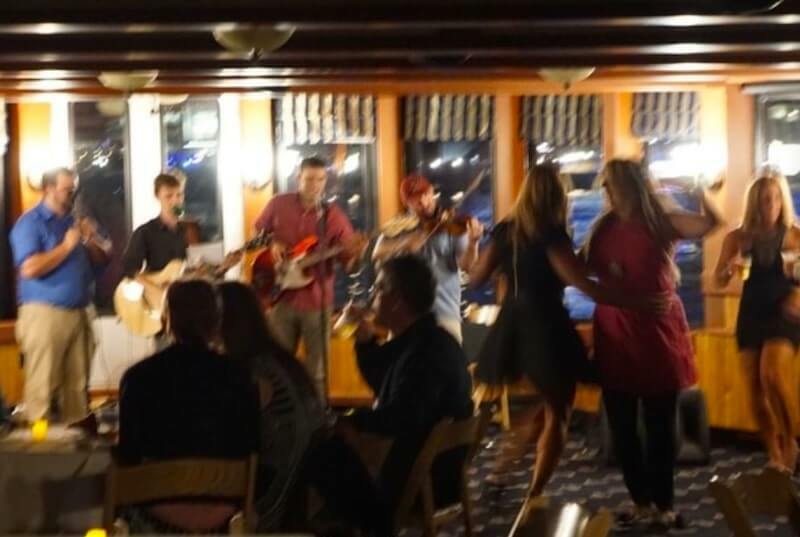 Irish music every night of the week, and often on Saturday and Sunday afternoons; weekend breakfast. J.J. Foley's Cafe (117 East Berkeley, in Boston's South End) - Family owned and operated since 1909, JJ Foley's offers a nice selection of Irish ale and cider, along with plenty of Guinness. For a taste of Ireland, order the Fish and Chips, and a side of Irish Brown Bread. For a special Irish treat, save room for dessert and order Banoffi Pie. If you're planning some serious St Patrick's Day celebrating at one or more of our fine Boston Irish pubs, a reservation at a nearby hotel means you'll have no worries about getting home or finding a non-celebrating designated driver. Best strategy: Think about where you'll be at Last Call, and make a hotel reservation nearby. For example, if you think you'll end up at one of the Irish pubs near TD Garden, make your reservation for conveniently-located The Boxer (shown above). 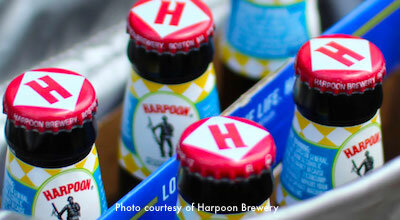 Boston's own Harpoon Brewery, located on the South Boston Waterfront, hosts its annual St Patrick's Day Festival. 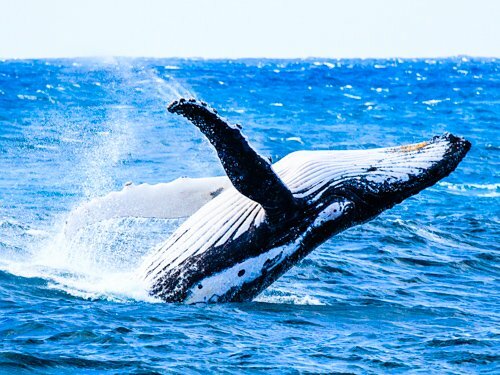 Join in the fun during the 2-day fest as local bands provide non-stop music while you sample the selection of Harpoon and UFO beers, and munch on homemade Harpoon pretzels. Designated Drivers get free non-alcoholic drinks. A free shuttle from South Station makes getting there and back easy. Find more details on the March Events Calendar. Boston is the most Irish of all American cities, with almost a quarter of all Boston residents claiming at least some Irish ancestry in the 2000 U.S. Census. Boston's Irish Heritage Trail celebrates the contributions of the Irish immigrants and their descendants to the city and the nation over the course of 3+ centuries. 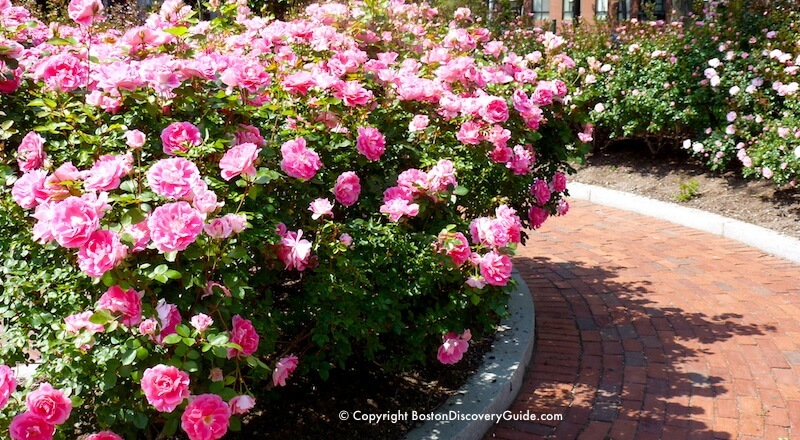 The Trail starts at the beautiful Rose Kennedy Rose Garden in the North End, stretches across more than 3 miles of Downtown Boston and Back Bay, and ends at Fenway Park. Walking along the self-guided Irish Heritage Trail is a popular St Patrick's Day activity. If you decide to do this too, you'll visit statues, monuments, and buildings ranging from multiple statues of Irish politician James Michael Curley to the moving Boston Irish Famine Memorial to the Massachusetts State House. Boston's Irish Film Festival takes place over a period of 4 days around St Patrick's Day each March. Films focus on Ireland and Irish culture, and what it means to be Irish in the 21st century. Films showcase feature the very best of contemporary Irish cinema - about 30 premiers, features, shorts, and documentaries in all, with a focus on productions unlikely to otherwise be shown in the U.S. The popularity of this event has grown each year, and tickets for some events sell out in advance. 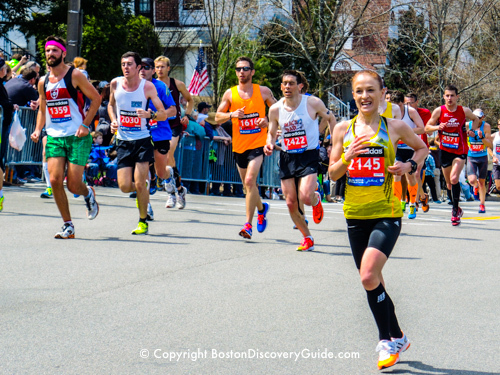 Check the March Boston Event Calendar for the exact date and time.